Mission Accomplished. Photo by Ben Travis. Mission accomplished. We exceeded our goal of 1250 patients, actually seeing 1300 people. Ray Dennis shared that they made over 1000 prescriptions for glasses, far more than on any other clinic mission he has joined. The high amount of astigmatism that the doctors saw is unusual, particularly because many of the children have the condition. Dr. Wendy Nelson-Evans, who is on her first mission clinic, explained that it is not an illness, but is the shape of the eye-like a football instead of round—and it is important that children are screened and corrective lenses used, ideally before they are age 6. If they do not receive and wear the corrective lenses in time, they will not be able to benefit from lenses later. This knowledge confirmed the importance of the work the medical team of the AFWP NATIVE EYES free clinic performed. A special thanks to Dr. Lionel Bordeaux, President of Sinte Gleska University. He was present at all events and ceremonies. He visited every day, shaking hands with every person in the Multipurpose Building—SGU staff, patients, clinic staff, and volunteers. His presence signaled to all that he fully supported Wendy Black-Nasta, Artists for World Peace, and the Native Eyes clinic. At the closing ceremony, he presented to Wendy a handmade red ribbon shawl, an “honor shawl” handmade specifically for Wendy. He also presented drumsticks to people he designated as leaders: Wendy, Dr. Tom Bates, our elder, and Amelia Lord, our chef, and Ray Dennis, in honor of their work and spirit. On our way out of town to our motel, we saw an SGU scrolling banner, thanking Wendy and the NATIVE EYES clinic. President Lionel Bordeaux, Wilma Bear Shield Robertson, Deborah Bordeaux, Roger Ellert Jr. , Maxine Bordeaux, Terry Grey, Cheryl Medearis, Gina,the faculty, students, staff and administrators of Sinte Gleska University helped smooth the organization and logistics of the entire week. I know some provided gas money to families to be able to come for their eye exams. Our work could not have happened without them. I would like to recognize the devotion of the doctors, technicians, documentary team, and lifestyle coaches, and all volunteers who made this clinic possible. Those who are freelance and self-employed sacrificed days of potential income. Moreover, all of the volunteers from Artists for World Peace, A Promise to Peru, Middlesex Community College, and Vision Health International paid for their airfare, lodging, rental cars and food that Amelia cooked for us as well as dinners that we ate after work. No slackers came on this trip. An eye clinic complete with reception area, registration, acuity, eye pressure, ophthalmology room and optical centers mushroomed up in less than three hours. A complete professional kitchen was stocked and organized in the same amount of time, with donations from the AFWP Council of Elders back in Connecticut. It is truly remarkable how all the different groups of people, many of whom did not know each other before arriving at Rosebud Reservation, clicked together to create a professional eye clinic facility. After we welcomed the last patients of the clinic, we closed this week with the giveaway, a traditional gift giving. Robin Wall Kimmerer (2013) shares a profound definition of wealth for tribal nations: “Generosity is simultaneously a moral and material imperative, especially among people who live close to the land and know its waves of plenty and scarcity. Where the well-being of one is linked to the well-being of all. Wealth among traditional people is measured by having enough to give away. Hoarding the gift, we become constipated with wealth, bloated with possessions, too heavy to join the dance” (p 381). As we learned during a dance demonstration program, dancing is an essential part of life for enjoyment and removing stress. If you would like to continue to dance, please donate to Artists for World Peace so that we can continue to provide much needed services to Rosebud Reservation, We thank all of our supporters for the help that made it possible for us to offer free eye care to the people of the Rosebud Reservation, and hope that support continues so that we can grow the sustainable programs that we envision in the future for Rosebud. The reveal of the day is a thank you to Sock Guys for contributing over a thousand pairs of socks to the Rosebud Community. Friday, June 8. Only one more day before the closing ceremony. One more beautiful landscape shot. The doctors saw approximately 317 patients today. We are running low on supplies and having to turn away people who do not have appointments. By Saturday morning, the doctors will have written over 1,000 prescriptions for glasses. Many of the recipients are children. The cultural program was to be a buffalo run, but calving has occurred and the bison are protective of their new babies. Tourists coming to invade their space is not optimal even if we do stay a large distance away. In addition, we have severe weather watches in place. After we finish the day, we rush home to beat the rain and see dramatic cloud formations that are threatening and beautiful at the same time. Much of the eye team stayed behind to finish up processing prescriptions and had to wait out the rain. Lightening flashes provided a fireworks display that some of us sat in a room with the lights off just to see. Enjoy is not quite the word because the strikes were so menacing, but we were fascinated by Nature’s show. Michele Wytas captured the amazing change in the sky. Before rushing to outrun the severe weather, we ate dinner together in the Multipurpose Building, thanks to Chef Amelia preparing two meals instead of the usual lunch and snacks. We held a meeting to discuss future plans for growing the free eye clinic to provide surgeries, medical care, housing projects, mental health counseling—6 teens committed suicide in one week earlier this spring—and wind turbine power generation for tribal use and for commercial development. Housing is a crucial need. Dr. Bordeaux told us that extended families live 18 to a 22×25 square foot home in some instances. The wait list for housing is thousands long. Another goal of the AFWP clinic is to have students from Rosebud Reservation learn to be optometrists, opticians, and ophthalmologists. Meghan Lehman: Very “giving back to her.” It’s a different type of giving from Ecuador because now the people of Rosebud will be able to see to drive and to work. Lizbeth Maldonado: A rewarding experience. A good feeling knowing you can help, especially with the children who can see well for the first time. She has had to hold back tears multiple times. Ray Dennis: Impressed by the dedication of all of the volunteers and support staff. Meaghan Frisbee: It has been a wonderful experience. Surprised by the amount of need for prescription lenses. Happy to help. Dr. Randy Rottman: Gratifying, humbled, always surprised by how different groups come together and work so well. Dr. Joseph Bacotti: Unbelievable. Very rewarding to see the appreciation of the people who needed eye care. Shane Spear: Overwhelming and humbling. Miguel DeLeon: Extremely exciting. Great exposure to a culture that is completely new to me. Found wonderful people who were so appreciative. I will definitely return. Keith Benboe: Awesome insight into Native American culture. Karen Dennis: Amazing honor to come out here. It’s been a real privilege. A clear need for consistent eye care and high level of need for young people especially. Dr. Robert Nasta: Beautifully amazing, tiring. Michele Wytas: Seeing what happens first hand after years of supporting Artists for World Peace behind the scenes makes it all real. Rosemarie Dennis: The vision teams are like a family. Rosemarie and Ray Dennis. Ray organized the eye teams and setup clinic logistics. June 7 It’s already Thursday? The week has flown. Wendy Black-Nasta talks with Chief Crow Dog and Dr. Lionel Bordeaux. J.W. Perkins took this photo. In her book, Braiding Sweetgrass: Indigenous Wisdom, Scientific Knowledge, and the Teachings of Plants (2013), Robin Wall Kimmerer, a member of the Potawatomi tribe, writes: “We are told that stories are living beings, they grow, they develop, they remember, they change not in their essence, but sometimes in their dress. . . .Traditional stories are the collective treasures of a people” (p. 386). Every day we have heard stories from patients, from each other as we get to know one another, and from our cultural guides such as President Bordeaux, Wilma Bear Shield, Patrick Bad Hand, singer and medicine man, Denise One Star, Terry Grey, Margaret MacKichan, director of the SGU Art Institute. Every story contains symbolism and meaning that stretches back into the past traditions and forward into the future of the Lakota and other tribes. We have shared and received sacred stories this week that will resonate with all of us for the rest of our lives. This day a man who is legendary left his sickbed to travel over two hours from Rapid City to see Wendy Black-Nasta, niece to Chief Luciano Perez, and greet the 35 members of the Artists for World Peace eye clinic team. Chief Leonard Crow Dog lead the American Indian Movement in the 1970s and risked his life to lead his people in pursuit of their rights. I remember reading about the courageous fight of the AIM grassroots efforts, including the “Longest Walk” on Washington, D.C. His visit demonstrated the appreciation he feels for Wendy, her uncle, Chief Luciano Perez, the free eye clinic initiative, and his people who are in need. My heart sped up at the significance of this meeting. played around the Multipurpose Building as Sue Cox from Connecticut led hiphop, yoga, and cardio classes. Sue Cox in an exercise move. I interviewed more of the doctors on the clinic team to find out about their organizations and motivations for agreeing to join the Artists for World Peace free eye clinic. Dr. Tom Bates, from Vision Health International, became involved because Ray Dennis is on their board and shared with them the AFWP plan for the eye clinic. Dr. Debra Messina of New York and co-founder of A Promise to Peru shared the story of that organization’s mission and accomplishments. When she was six years old her father entered the Indian Health Service and was posted for two years in New Mexico where he cared for vision needs of the tribal community. Dr. Messina saw the powerful connection of the people with her father. Service to first people nations stayed in her mind until she decided to initiate that effort. The A Promise to Peru medical and vision teams have cared for over 13,000 patients since their founding in 2011, when their first clinic went to Peru as a medical mission. Dr Messina, an ophthalmologist, saw that many of the people being treated for health issues had serious eye conditions, often needing surgery. The next year she led an eye team to perform surgeries. The most moving moment so far for Dr. Messina was when a patient asked her why no one pays attention to the health care needs on the Reservation. Dr. Debra Messina, co-founder of A Promise to Peru. 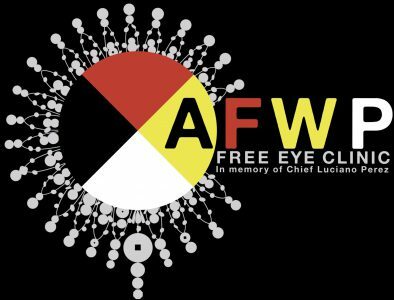 Because of Dr. Bordeaux’s commitment to the community and his respect for Wendy’s uncle, and Wendy, Artists for World Peace has been able to include A Promise to Peru, Middlesex Community College, and Vision Health International in the NativeEyes Free eye clinic. Dr. Joseph Bacotti, a member of the Vision Health International team, spoke about the immense reward he feels helping people who need vision care. He has traveled on many overseas missions and is happy that VHI has joined AFWP’s first free eye clinic on the Rosebud Reservation. Dr. Robert Nasta, Professor of Music at Middlesex Community College, composer, musicologist and music director for AFWP, is the sound editor for the documentary team, which includes as well Claudia Paul, J.W. Perkins, and Ben Travers. Dr. Nasta is also a major support for Wendy and the entire team. He and Wendy celebrated their 36th wedding anniversary during this trip, but they have been together for 41 years. Dr. Nasta performs the post production sound editing and scores the documentary videos. He carries furniture and does the financial record keeping of money coming in and going out. He does whatever needs to be done. So far for him, the most moving events have been the patients coming to the clinic, Dr. Lionel Bordeaux’s welcoming us and working with us as well as his hospitality and openness to working with AFWP. Another important moment was the visit by Chief Leonard Crow Dog. Claudia Paul shooting on location on Rosebud Reservation, South Dakota. Taken by Wendy Black-Nasta. Claudia Paul (Ms. Harlem) is the lead videographer, interviewer, and editor of the documentary team. She met Wendy through a mutual friend with whom Ms. Paul worked creating a documentary film project following one woman throughout her breast cancer treatment. Shortly after she met Wendy, Ms. Paul asked Wendy if she ever needed a photographer. It just so happened that AFWP did need someone to document an upcoming mission to Tanzania. Ms. Paul said “yes” immediately and has documented trips in 2012, 14, 16, and 18. When Wendy asked if she could shoot some video, Ms. Paul worried that she would not be able to include her photographic visual aesthetic in film, but she soon realized that she absolutely could. Those readers who visit the AFWP Facebook pages can see the documentaries from past trips that Claudia, J. W. Perkins, and Dr. Robert Nasta have created. When comparing the missions to Tanzania and Rosebud Reservation, she notes that the welcomes from the people in both places is the same—warm and heartfelt. The highlight so far for her was the interview with Dr. Tom Bates whose openhearted passion and excitement impressed her. At 82 years old, he works constantly and is a role model for future generations of physicians. well. Amelia is a freelance chef, caterer, cooking instructor, and nutrition expert. She also is a wonderful mentor and instructor to everyone in the kitchen. With the help of students Sunita Blue Thunder and Keshena One Star, and AFWP Nikky Travers. Michele Wytas took this photo of a typical field on the road from the university to the casino Motel. Today was a little slower in the number of people being checked. Ray Dennis shared that the oldest patient so far that has received an examination is 98 years old. We have reached our midweek goal of seeing approximately 600 people. From Florida, Dr. Tom Bates of Vision Health International has participated in over 30 clinics. He is our oldest participant at age 82. His passion about his service to neglected populations resonates with everyone who encounters him. When I asked him about the most moving experience of his trip so far, he teared up as he described the opening blessing ceremony. Clearly, it was a profound experience for him as it was for many of us. He loves the people of the Rosebud Reservation and the Sinte Gleska University and appreciates their beliefs that we are all connected to each other and mother earth. The family names that reflect this connection to nature fascinate him. As word reaches other areas of the reservation, people are coming by to walk in for eye appointments. Many return with their artwork. Mark Little Elk was here for his eye exam and was so overwhelmed by the mission of AFWP that he has painted a beautiful 6×6 canvas for the peace wall project and donated the first painting that he has made since he has returned to making his art. He shared the story of his 6×6 work: his daughter committed suicide at age 14. She was ardent about organ donation and had signed a donation card. Five of her organs went to five women, ages 2-45, and saved their lives. The feather in the image represents her and the five beads symbolize the five lives she saved. The medicine wheel refers to Mark’s own recovery path. Jewelry makers visited us with intricate beaded earrings, bracelets, and key chains among other items. Maria LaPointe brought in her gorgeous dentalium (a tubelike mollusk shell) and beaded earrings. Vernie Blue Thunder also shared his beadwork earrings and bracelets. Others may have dropped by and I missed them. My apologies for that. My friends know that I tend to shop for jewelry when I travel, so that apology is sincere for many reasons. Vida Red Bird brought in dried turnips, called tinpisla, that are harvested, peeled, and braided together this time of year. It is traditionally used in soups and will last ten years. Vida Red Bird and braids of tinpisla. Mark Little Elk and his 6×6 painting. A note to clarify some misconceptions: a great warrior is not the person who has killed the most people as in the movies and television, but the person who has performed service to others or accomplished achievements. Men and women may receive an eagle feather for these acts. After our day ended, we had the good fortune to receive a private educational and demonstration session on the various dance styles. Pat Bad Hand led us in smudging and prayer ceremonies to open the program. Denise One Star shared that it is believed that dance helps heal and keeps us from acting out our negativity. She explained that enjoyment is one of the necessities of a healthy life and dance encourages that positive energy. The drumming is the heartbeat of Mother Earth. We learned that each dance style has a story as its basis. For instance, the jingle dance, which has beads made from rolled chewing tobacco tin lids, originated as a healing dance for a sick child. The grass dancers, who are men, actually press the tall grasses down and help prepare the soil for cultivation. The traditional dance for women is stationary. The women’s feet never leave the ground, symbolizing their connection to the earth. Another dance by women, the fancy shawl dance takes enormous energy and grace. As the dancer leaps, swirls and twists, the fringe flows around her. This dance and the jingle originated around the 1920’s. Indian dance is constantly evolving with additions or modifications, reflecting the dancer’s style. We ended with group participation and were led in a couples’ dance called the Rabbit Dance, which is a chain of dancers who circle and snake around. We almost caught Claudia Paul, our videographer, as we snaked into a coil, wrapping her in the middle. The program ended as it had begun, with a prayer. Wendy Black-Nasta, the visionary energy behind Artists for World Peace, helps with patient registration. Yesterday was a fantastic first day of the clinic. Today was even more amazing. 245 people received eye exams. Helping with the visual acuity exam, I pointed at the letters on the eye charts for the patients. Some of them actually could not even see that huge E at the top. There is great need for this clinic. The residents of Rosebud express their appreciation and comment on the kindness of everyone of the AFWP, Sinte Gleska University, A Promise to Peru, Vision Health International, MIddlesex Community College, and local volunteer crews. Laughter echoes among patients and volunteers alike. The people could not be any nicer. Our official hours are 9-5, but each day we have been finishing closer to 6. The doctors and technicians are devoted to caring for as many people as possible and have to be urged to eat and take breaks. Of course, Chef Amelia’s cooking is so delicious and healthy that it doesn’t take much urging. Another insurance that they eat is that Wendy Black-Nasta decided no appointments are to be scheduled during 12-1, but exams do run over into that time. I can see that without these steps, the entire team would keep working through the day until they collapsed at night. Keshena One Star, a student at SGU and photographer, has been a great help in the kitchen this week. Sunita Blue Thunder, Miss SGU and an art student, has also been helping in the kitchen. After we finished the clinic for the day, we walked over to the Sicangu Lakota Heritage Center, which the director, Terry Grey, kept open for us. He explained the purpose of the Center: to preserve the history and culture of the Sicangu Lakota people and serve as an educational resource. Terry shared artifacts and the symbolism in the dress and decorated items such as moccasins and cradle boards. Comments from past elders narrate the exhibits. For instance, one shared that the cradle board is quite comfortable, contrary to our associations with the word board as something hard. They are padded and also decorated with beadwork or quill work, including the star and diamond symbols, which represent the four directions of the medicine wheel. The rich beadwork on the cradle boards and moccasins is symbolic as well as gorgeous. A person wants to be buried in fine moccasins. Elders carried a pair in a pouch hooked to a belt to be ready. These are only two highlights of the museum displays. Manuscript and photo archives as well as the material culture artifacts are preserved here, including the Sinte Gleska University collection. Today, 210 people had registered for the eye clinic and the medical team processed 211. That may even be a low number, according to Wilma Bear Shield, who directed the registration. After our group photo, everyone went to their stations ready to welcome the members of the Sicangu Lakota community from the Rosebud Reservation to receive eye checkups. The clinical team examined 30 people an hour starting at 9 a.m. and finishing a little after 5. The energy is upbeat and positive. The smiles on patients’ faces as they walk out of the clinic are wonderful to see. The art table and face painting stations are a hit with everyone. Jamie Datino, our director of the art tent, organized the projects. The youngest patient today was a three-year old girl. I will be posting more photos from the face painting and art tent as the week progresses. Donations of art supplies came from Jeannie Distler and Catherine Bryant of Louisville, Kentucky donated many of the art supplies. Jeannie is having a wonderful time painting with everyone coming through our art tent. Even Dr. John Distler has his face painted. Christine Solimini-Swift, our nutritionist and health coach, is providing people with diabetes and heart disease issues counseling about nutrition and exercise. To help individuals understand the amount of sugar common drinks and food contain, she created a visual display of sugar in clear cups with the type of item such as a soda or apple juice. We know of food deserts in urban settings, but tend to forget about the rural areas where grocery stores are miles away and the food available at convenience stores consists of sugary and salty junk food. Having the money to buy healthy food and transportation to healthy food sources are issues many of us have the privilege to take for granted. All the people coming for eye exams receive a bag lunch, provided by the Mission community. To keep up the strength of the volunteer team, Chef Amelia Lord is nurturing us with delicious organic lunches. We are so lucky to have her cooking her love for us into every meal. Because Wendy Black-Nasta wants the team members to learn about the Sicangu Lakota culture and history, we were blessed by President Bordeaux who then showed us a video of Senator Daniel Inouye making the case in 2000 for the federal government to support a National Indian University. This university would be for all tribal nations with online classes augmenting face-to-face classes. A special emphasis would be on medicine, law and social work. SGU has its own herd of bison that we are blessed to be seeing on Wednesday. A herd survived on Catalina Island, where they had been brought to star in a film. When the Catalina residents became fed up with the successful breeding and population growth of the bison on the island, they offered to give them to a group that wanted them. SGU offered to take them and a tribal group in California paid for the transport to Mission, South Dakota. Wilma Bear Shield, a member of the Planning and Development Office of SGU, educated us about the Sicangu Lakota’s deep connection to nature and the environment that forms the basis of many of the family names. She also shared a memory about sneaking down to listen to her uncles tell stories about the history of her people. She believes that younger generations suffer because they do not know this history. In addition, certain ceremonies of the community could help heal. In the wake of the tragic shootings in our country, she told us about the Lakota “Wiping of the Tears” ceremony in which the community gathers to help with healing after the passing away of someone. When a father or mother passes on to the spirit world, the family may call out to their parent, but the parent cannot answer anymore. In the “Making of Relatives Ceremony” someone becomes the father or mother who will answer if they call for their mother or father. Wilma reminded us that we are all related. We see the beauty of the community with the families attending the clinic—many have taken in children who do not have parents or need a home while their parents are not available. Cousins often grow up together in these situations so that their aunt is a mother and their cousin is a sister or brother. Children are the responsibility of everyone. The definition of family is expansive. Did I mention Chef Amelia Lord’s socks? Graciously, she has agreed to the Big Reveal of what no one sees when she is cooking. Today the eye clinic team and the Artists for World Peace crew gathered at Sinte Gleska University in Mission, South Dakota for a blessing ceremony for all of the volunteers as well as the patients coming to the clinic. Before the blessing, the President of Sinte Gleska University, Dr Leonard (Lionel) Bordeaux, honored us with a welcome and story of the University and his path to the presidency. He was 32 years old, when a medicine man sought him out in Minnesota where he was taking his doctoral degree and informed him that the ancestral spirits told the tribal elders that Dr. Bordeaux was the person to lead Sinte Gleska University into the future. His 46th anniversary as president of SGU was this year. Since his acceptance of the leadership, he has expanded the buildings, which make an institution permanent rather than ephemeral. The first building for the university was an abandoned structure that was hooked to electricity by an extension cord strung from the tribal administration headquarters. Through grants and donors such as Patrick Lannan, SGU has grown into a campus of buildings that serve as a symbol of the commitment to higher education. To learn more about Sinte Gleska University, go to: http://www.sintegleska.edu/discover-sgu.html. Dr Leonard (Lionel) Bordeaux, President of Sinte Gleska University, in his office, wearing the Artists for World Peace belt. Outside the multipurpose building, all of us formed a circle around a fire for the smudging and blessing ceremony. A medicine man led the ceremony. It was so powerful that we felt mesmerized and awed. We felt truly blessed and empowered for the week ahead. After lunch, both teams set up their respective clinic and classroom locations. It is so impressive to see the intense work everyone contributed. Monday morning at 9 a.m., the free eye clinic opens its doors in the campus multipurpose building, which became a well-organized clinic, art tent, exercise and health education facility. The CT team that was stuck in O’Hare arrives. SGU Multipurpose Building where the clinic is being held. Rosebud Reservation is almost 1 million acres, but is among the poorest and has a high diabetes rate. The 1,250 people who will receive free eye tests will be screened for cataracts, glaucoma, and vision adjustments with corrective glasses. Some have never had the chance to receive an eye check up. Members of the AFWP will be leading information classes on nutrition, diabetes and heart disease prevention, and exercise to help keep fit and healthy. An art tent will encourage children and adults to express themselves creatively. A peace quilt project and paintings on canvas for a peace wall are planned. The goal is to hold annual clinics. Did I mention the prairie dogs? When we arrived on campus Sunday morning for the blessing ceremony and clinic set up, all of us who have never seen prairie dogs outside of a television, oohed and awed at the cute little guys and immediately began taking photos and video of them. During the prayer songs, the prairie dogs that populate the lawn stood at attention and faced the direction of the ceremony, despite more than 40 people only a few feet away.